Have you always wanted to be part of an MLB team? Well, now is your chance! 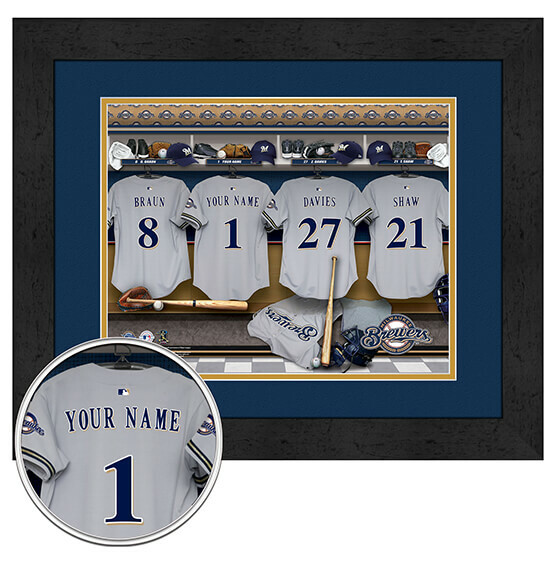 With our customizable Milwaukee Brewers Personalized Locker Room Framed Wall decor, your name will be a part of the Brewers' locker room crew. Just let us know the name or nickname you want to add (up to 12 characters) and we will do the rest! The result? A sports decor piece that knocks it out of the park. Featuring a digital double mat format with team colors, a sleek black frame, glass and high-quality printed paper, this one-of-a-kind print is sure to be a home run.